As GOP tries to repeal Obamacare, will Price be architect of its replacement? The Republican-controlled Senate has launched itself in a late-night session on the path to its long-pledged repeal and replacement of the Affordable Care Act, aka Obamacare. The GOP-controlled House on Friday the 13th followed close behind. Lawmakers have chosen a complex parliamentary path. GOP members are expressing confusion about their way forward, even as doubts are being voiced by GOP governors in states where the ACA has expanded health care for the poor through Medicaid. The president-elect has called for swift action — insisting on not just Obamacare’s repeal but also its replacement with an undefined plan that he says will provide health care coverage that’s better than what exists now and for more Americans. With big, many, and byzantine legislative steps needing to be taken even beyond “repeal,” can the ACA be replaced, too — and with what? Because the incoming administration isn’t among the most seasoned in getting things done in Washington, D.C., Tom Price, the president-elect’s nominee to head the trillion-dollar federal Health and Human Services Department, may play an outsize role in what happens with the ACA, if confirmed by the Senate. The Georgia orthopedic surgeon has been one of the Hill’s leading GOP voices opposing Obamacare, and in providing his conservative legislation to replace it. What’s known about him and his health care proposals? I’ve written about Price’s doctor-focused views of health care, notably his zealous, unwarranted efforts to curb injured patients’ rights to sue for medical harms. He’s also anti-abortion, and has been criticized by women’s and gay rights groups. He has advocated for changes in Medicare to allow doctors to collect more from patients by opting out of the program and entering private contracts with beneficiaries. He opposes government’s role in the private sector, and especially in health care. This “interference,” he has said, led him to politics and his run for Congress, where the University of Michigan and Emory educated and trained orthopedist has represented an affluent suburban area of Atlanta that also sent Newt Gingrich to the Hill. His staunch conservative views and his potentially giant influence over American health care – a sector that represents 17.5 percent of the American GDP — make his confirmation process likely to receive considerable attention. He’s already caused deep divisions among members of the American Medical Association. Price also has raised eyebrows about his finances. The 50th wealthiest member of Congress, he has invested heavily in health care-related companies, including Big Pharma holdings. The Wall Street Journal has reported that he traded more than $300,000 in shares of health-related companies, even as he sponsored and advocated legislation that would affect the corporations’ stock. Watchdogs have zeroed in on how he benefited from a “sweetheart” deal in which just he and another congressman, New York Republican Chris Collins, paid 18 cents per share for an Australian company’s stock. Those shares are expected to increase in value to as much as $2 per share — especially if the company can overcome hurdles from U.S. regulators. 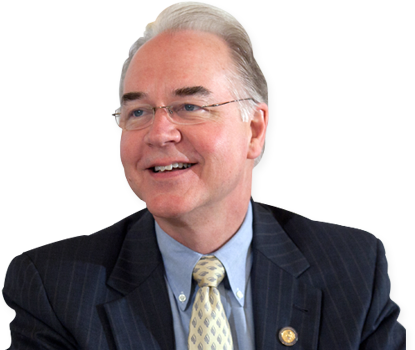 Price also has been a powerful advocate in seeking special treatment for his health industry donors, Kaiser Health News Service reported. His hometown newspaper says that he has reaped almost $5 million in donations from the health care sector during his term, and that he has been poor in identifying who gives him money as the law requires. After Democrats and public interest groups assailed Price for potential conflicts of interest, he has told federal ethics watchdogs that he would divest his holdings in more than 40 companies, including Aetna, Amgen, Eli Lilly, Pfizer, Amazon, Facebook, Delta Airlines, and Northrop Grumman. He is stepping down as an AMA delegate and will for at least a year recuse himself from issues involving the organization or member he knows from it. He is retaining his interest in his medical practice, where he is managing partner, but will not work for or with it. The challenges in replacing Obamacare will be, as the president-elect likes to say, huge. As the New York Times’ Upshot column notes, any replacement must result in major trade-offs, and it won’t be easy to achieve legislative consensus and action on these. The Wall Street Journal reports that it will be a bipartisan conundrum for the nation to figure how to pay for the care of those most sick, the 10 percent of Americans who, according to estimates, may run up 70 percent of health care costs. The ACA has had broad reach in changing health care, with the latest concern rising about its repeal focusing on whether this may undercut efforts to combat the opioid drug abuse epidemic. There are major concerns how the act’s repeal could endanger rural health care, where many poorer, sicker Americans benefited from Medicaid expansion under Obamacare or through its financial supports, such as for prescription medications. Many of these Americans voted for the president-elect, or didn’t see Obamacare benefits because Republicans blocked Medicaid expansion in their area. The AARP, one of the nation’s largest and most influential groups representing seniors, is ringing alarms on how an ACA repeal-replacement effort also could hurt Medicare. AARP notes that Obamacare-related savings have helped significantly to improve the finances of Medicare — which partisans, counterfactually, keep insisting is in immediate, dire condition. It isn’t. Both the New York Times and the Washington Post have examined Obamacare’s impacts and how partisans will struggle to change it. I’ve written how some savvy health policy experts have tried to summarize in seven questions to Congress an acid test whether any prospective Obamacare replacement is worthwhile for the country. But because the president-elect clearly isn’t a details nor a policy guy, and most of partisans who have attacked Obamacare for seven years and voted several dozen times in the U.S. House to repeal it haven’t also offered anything concrete about its replacement, the Price plan needs more scrutiny. The House speaker has wrapped it into his thinking and plans. A tip of the hat to an insurer group for its seven-point synopsis of the Price plan. Meantime, National Public Radio has offered a five-point look at it. Here’s what the New York Times reported about it, and what Politico has found on what it calls a “radically conservative” proposal, which Forbes weighs and sees issues as it deals with major issue of mandated coverage of preexisting conditions. To be eminently clear, the Price plan is far from adoption. Analysts already say that it might achieve some of its goals by offering bare bones coverage, particularly to the young, who get more of what government support is in the plan, versus what happens to the old. It would be heavily weighted to the wealthier, who can take advantage of elements like higher deductibles and health saver accounts (those will seem far off to the six in 10 Americans who, a recent survey found, lack $500 in savings). The Price plan also puts a high priority on Americans getting health insurance only if they keep their coverage continuously — again, an aspect that poses bigger concerns for poorer Americans, who may suffer more layoffs and other job losses that can cause them to stop paying for insurance during a household financial crisis. The GOP insistence, evident in the Price plan, that their replacement will improve Obamacare by introducing greater insurer competition by opening cross-state sales has been debunked. What’s next? Our crucial right to health care — products and services that are widely accessible, affordable, excellent, safe, and efficient — is in deep doubt. We all need to be all over this.